My main take-away from the KEEN conference thismonth is a function of my lens as a tenure-track assistant professor who focuses on conducting EER. I facilitated a workshop with Drs. Cox and Kajfez about integrating EER and EML. My insight was that The Ohio State University may have a significant contribution to make to the KEEN network in this area. I began thinking about how we might model some sort of way to consult with other KEEN schools who are interested in partnering to conduct EER with respect to their unique ways of implementing EML at their institutions. From talking to attendees from across the nation, I got the impression that many KEEN schools are interested in how to more rigorously investigate their revised classroom interventions with respect to many outcomes. Additionally, I believe Ohio State has the opportunity to leverage our new department to push the network towards even more comprehensive scholarship related to KEEN’s mission. 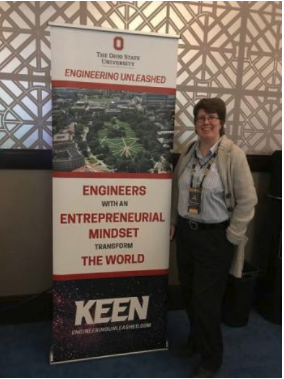 Through the KEEN National Conference, I got to see how large and connected the network is firsthand. At the sessions and during the networking events, I ran into colleagues who I’ve known through other networks and thought it was amazing how KEEN is bringing together engineering educators from so many different places. I also meant new colleagues from places I would not meet if it were not for KEEN. The power and reach of the network really struck me the next week when I was at a disciplinary engineering conference and ran into someone I meant the week before at the KEEN National Conference! Through this network, we can change engineering education, and I am so excited to be part of unleashing our students' potential! In first-year engineering we have done many different activities with students to allow them to engage with the design process or a production process. Some of these include, the marble carrier activity, the spaghetti marshmallow tower, the Quality and Productivity Lab, the “Buckeye” challenge (another tower build), paper airplane creation/design, software design projects, and semester-long design and build projects. After attending a KEEN workshop session on some team activities from Olin College, it is clear to me that the network is a great place for us to get additional ideas to keep these activities “fresh and new”. The “Games Teams Play: Functional Activities for Developing Entrepreneurial ‘Team’ Mindsets” workshop demonstrated three games that could be used on our courses to teach things like design, iteration, process, and customer feedback. Being a part of this network is a great opportunity for us to learn from the other schools, get ideas to use in the classroom, and share things we have done in our courses with others. I participated in several assessment related sections at the 2018 KEEN National Conference, including a pre-conference KEEN assessment working group (AWG) meeting and three workshops. These activities were great for me to understand the context of some tools for assessing students’ entrepreneurial mindset that have been shared through the KEEN AWG. I also believe that Ohio State has a lot to offer to the network with our research in engineering education and our ongoing project, which will integrate EML in first year engineering courses. For example, the EED has developed a framework for defining student achievement at basic, intermediate, and advanced levels for a given learning outcome. This framework would be appreciated by our colleagues at other KEEN institutions, for it provides a way to create progressive EML experience across a curriculum.